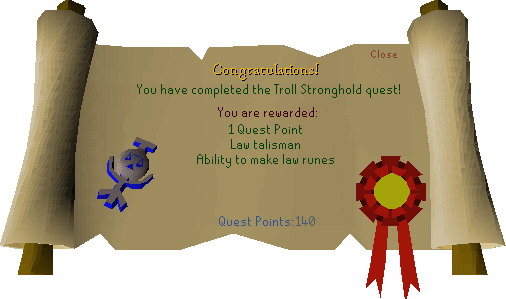 Able to defeat a level 113 Troll General. Can be safe spotted. Speak to Denulth in the camp in the south of Burthorpe. Follow the path to the stronghold. You will require Climbing boots for parts of it. Enter the arena and nearly kill Dad. He can be safe spotted from the gate. After nearly killing Dad exit the arena through the north gate. Go through the cave and continue on the path to the stronghold. To deal with Thrower trolls either sprint past them, use Protect from Missiles or use the agility shortcuts. Follow the red path to Troll Generals. 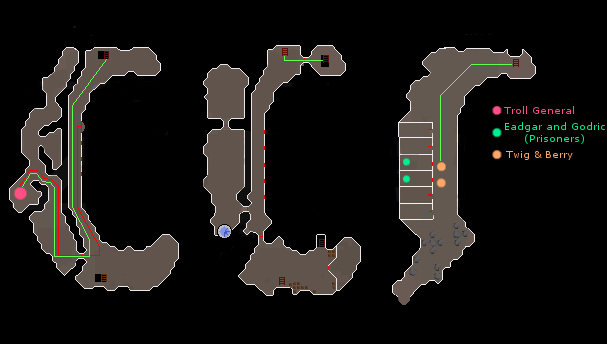 Kill one and loot the prison key. Follow the green path to the jail. Either pickpocket or kill the sleeping Twig and Berry trolls, then free the prisoners. Teleport to Burthorpe or follow the prisoners out the secret exit. Once outside climb over the southeastern rocks. Talk to Dunstan to complete the quest. 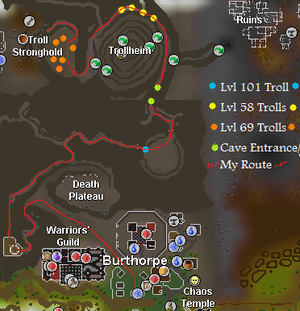 Access to Trollheim and the Troll Stronghold area.